The idea is to discourage consumers from buying sugary drinks while raising revenue for nutrition and education programs. Some Seattle store owners say they may suffer collateral damage from the increased expense. Seattle is turning soda pop into strawberries, tomatoes and salad greens. Doctors say the main point is to discourage people from buying sugary drinks — which have been linked to type 2 diabetes, hypertension, heart disease and dental decay. Seattle officials have a plan for the revenue, expected to total $15 million in the first year. Some of the money will go to expand the city’s Fresh Bucks program, which provides low-income families with vouchers to buy fruits and vegetables at farmers markets and some grocery stores. The arrangement makes sense to Jeniffer Trice, a Central District mother of five who had vouchers prescribed for her family at a neighborhood health clinic this year. Finger grapes were among the treats her children chose while shopping. Trice, 33, selected corn for making soup. Her 6-year-old son, Jordan, smiled wide as he remembered tasting Golden Delicious apples for the first time. Fresh Bucks is one of several nutrition and education programs slated to receive funding from the tax. But not every dollar will reach Seattle families. Only $400,000 of the tax revenue set aside for Fresh Bucks in 2018 will be spent on produce vouchers. The rest of the $2 million for Fresh Bucks is aimed at administrative costs, such as outreach, technology and hiring five additional city employees to carry out the program’s expansion. 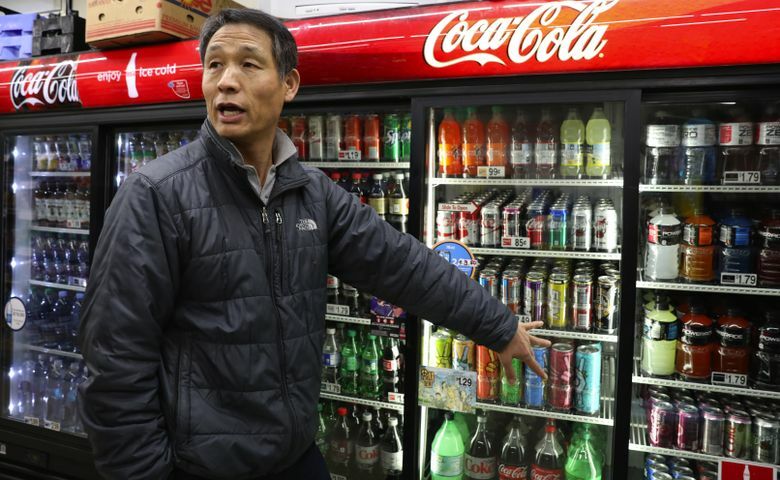 Bracing for a hit are business owners like Jong Kim, who expects soda sales to drop at his Capitol Hill corner store as the tax of 1.75 cents per ounce drives up prices. When his distributor raises its prices, Kim will ask his customers to pay more. 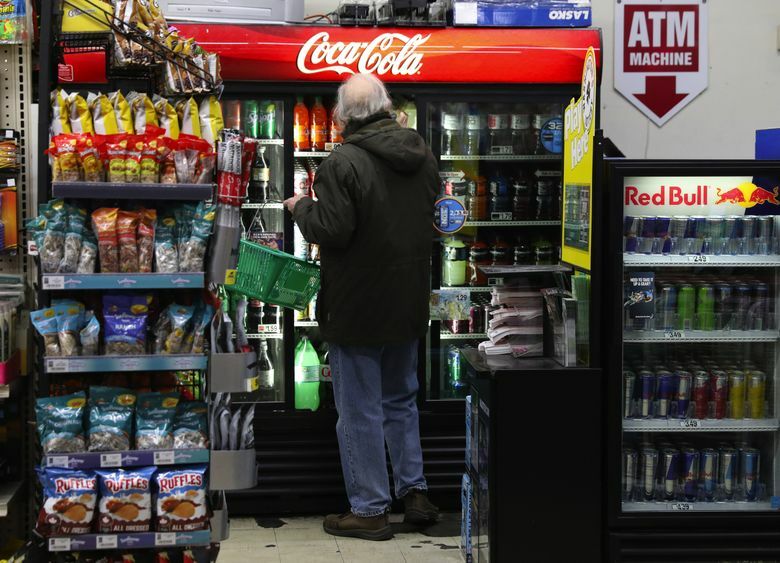 The longtime store owner will charge $2.14 for a 20-ounce soda, up from $1.79, he said. The steep tax on a 12-pack of Coke cans will be $2.52. A coalition of Seattle businesses backed by the American Beverage Association has handed out more than 100,000 fliers warning consumers of the higher prices, spokesman Jim Desler said. In Philadelphia, where a sweetened-beverage tax took effect this year, non-chain retailers have passed on 100 percent of the cost, according to preliminary research. Kim may stock more diet and zero-calorie drinks, which are exempt from the tax, he said. But in the short term, he predicts his bottom line will suffer from lost sales. 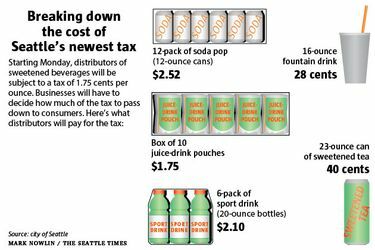 Then-Mayor Ed Murray proposed a sweetened-beverage tax in February. Later, a racial-equity analysis said that including diet beverages — which are more popular among wealthy people and white people — would make the tax more fair. But the council chose to exclude diet drinks, with then-Councilmember Tim Burgess citing unclear health findings on artificial sweeteners and concerns about job losses. “Leaving diet drinks untaxed gives consumers an alternative,” he said at the time. Other products not covered by the tax include weight-loss and meal-replacement drinks, baby formula, alcoholic beverages and 100 percent fruit juice. Also exempted are sugary beverages that have milk as their primary ingredient, such as lattes supercharged with sweet syrups. In addition to regular sodas like Coke, the tax applies to sport drinks such as Gatorade and energy drinks like Red Bull. The tax will apply to any nonalcoholic beverage or beverage concentrate that lists as an ingredient any caloric-based sweetener. For that reason, many juice-based drinks will be taxed. Because the city will collect the tax from distributors rather than consumers, some of the rules are complicated. For example, a box of syrup distributed for use in a soda fountain will be taxed on the volume of beverage the syrup is capable of producing. Retailers won’t be allowed to dodge the tax by using distributors outside the city. A retailer bringing drinks into Seattle will be considered a distributor and will pay the tax. Smaller manufacturers will be eligible for special deals when they distribute their own beverages. Those with gross annual incomes between $2 million and $5 million can pay only 1 cent per ounce, while those with incomes of $2 million or less can pay none. Sara Bleich, a Harvard public-health professor studying Philadelphia’s tax, says soda drinking has been decreasing for years — among all ages and most groups. Consumption remains highest among black and Hispanic consumers who also are at greater risk for obesity, Bleich said, describing soda taxes as a tool to protect those people and others. The soda industry markets heavily to children, for instance. In April, a study said sales of sugary beverages dropped nearly 10 percent during the first year of Berkeley, California’s tax, while sales of water increased. 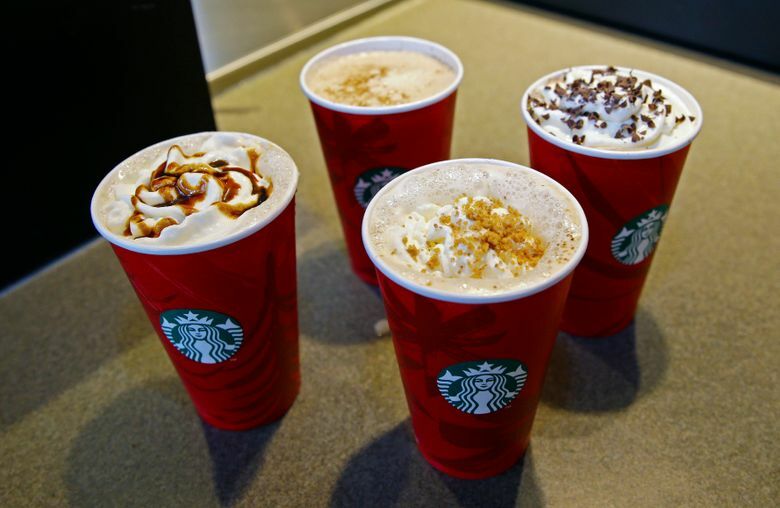 Last month, Bleich presented early data showing a 57 percent plunge in beverage sales at chain stores during the first six months of Philadelphia’s tax. But the reduction doesn’t appear to be driving down those stores’ overall sales, the professor said. Seattle’s tax is much larger than Berkeley’s but the Emerald City is wealthier than Philadelphia, so Bleich is unsure what will happen here. Also looking ahead is Steven Hooper, who runs a stir-fry startup called Kigo Kitchen. The restaurant may increase its production of in-house specialty drinks, Hooper said. The restaurant owner thinks Seattle officials should have been more honest about the impact the tax will have on businesses like his. On the other hand, “As a progressive Seattle voter and business leader, I’m all for anything that reduces consumption of things that make people less healthy,” he said. Under Murray’s initial plan, most of the sweetened-beverage tax revenue would have gone to education programs for low-income and otherwise disadvantaged children. But the council, under pressure from community organizations such as South Seattle-based Got Green, directed more money toward food-access programs. In addition to the $2 million reserved for Fresh Bucks, food banks will receive just over $150,000 in support. Nearly $1.4 million in projected revenue has been pledged for community-college tuition assistance, while about $4.6 million has been tapped for other education-related programs, such as mentoring for young black men and literacy for 2-year-olds and 3-year-olds. The city has allocated $500,000 to help retrain any beverage-industry workers who may lose their jobs, set aside about $1 million for administrative costs related to setting up the tax, and will pay University of Washington researchers $500,000 to study what happens after the tax takes effect. A community-advisory board will decide where another chunk of the money ends up, with multiple food-access programs likely to receive portions. 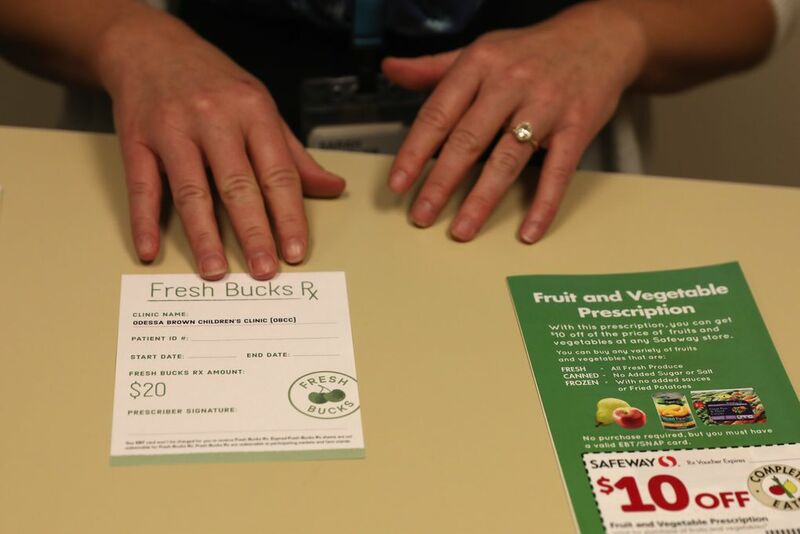 Now available only to families on food stamps, the tax should help make Fresh Bucks vouchers available to other families who report trouble paying for groceries. An aim of the Fresh Bucks expansion will be recruiting more retailers to accept the vouchers, including mom-and-pop corner stores. When a federal grant runs out in 2019, the city will use $1 million in tax money for the vouchers, Formas said. Trice didn’t initially consider herself a supporter of the sweetened beverage tax. She changed her mind when she learned it would help families buy produce, she said. Jay Heo remains skeptical. The manager at Kim’s store is particularly worried about what may happen in the summer, when cold drinks are key to sales. Which is exactly what doctors like Mary Ann Bauman are hoping for. The American Heart Association board member, a primary-care internist who lives in South Lake Union, has spent her career watching diabetes and heart problems devastate families, she said.